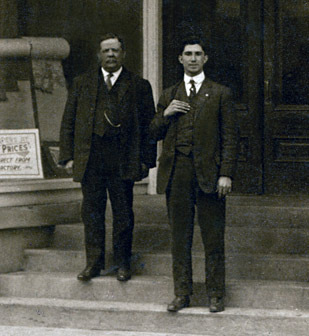 Comments: (L to R) U.S. Postmaster Samuel R. Gault and his assistant, Ashby Mayo, stand in front of the Scottsville Post Office located in the Masonic Building at 137 Main Street. The Masonic Building was built in 1914 and hosted the town's post office on the bottom floor from 1915 until 1964 when the post office moved to its next location on West Main Street. Sam Gault served as Scottsville's postmaster from 1893 to 1939; he was succeeded by Ashby Mayo in 1939, who retired as postmaster in 1958. Postmaster Gault was known as Mr. Scottsville for he was always at the center of town activity. Every summer week night, townspeople would stroll to Scottsville's C&O Depot to watch the No. 11 train arrive from Richmond. Postmaster Gault would collect the town's mail from the train and take it back to the post office for sorting that evening as townspeople waited. Gault was not required to open the mail those nights, but he didn't want people to have to wait until the next morning for their mail. Gault also was Chief Marshall of town parades, an active member of Masonic Lodge No. 45, friend of prominent politicians (Senator Thomas Martin, President Theodore Roosevelt), and owner of a sassafras oil mill on Driver's Hill just to the east of Scottsville. Gault was born in 1853 in Pennsylvania and passed away in 1939 in Scottsville; he is buried at Scottsville Cemetery. An official letter, dated 1923, from S.R. 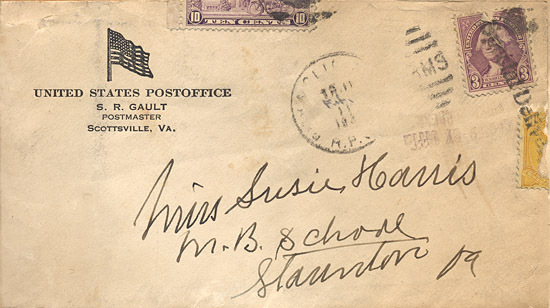 Gault, U.S. Postmaster in Scottsville. ment, was born in Scottsville on July 1, 1894, to Eplem Edgar Mayo (1853-1934) and Virginia (Kidd) Mayo (1861-1924). 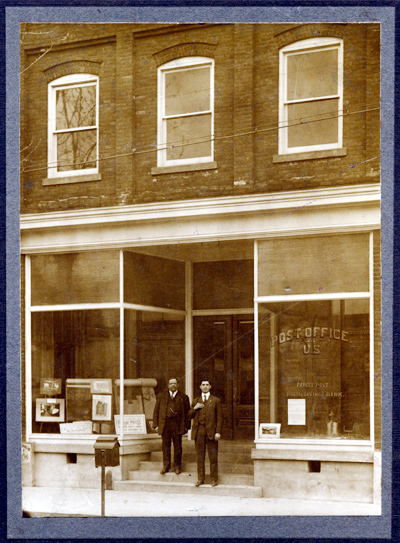 He attended Scottsville schools, and he first entered the postal service in Scottsville on September 1, 1912, when Samuel R. Gault was postmaster and the Scottsville post office was located at 358 Valley Street. During WW I, Mayo served overseas in the U.S. Army as a Corporal, Co. A, 323 Infantry and was discharged on May 30, 1919. After the war, Mayo served for nine months as a railway postal clerk on the Richmond division and then returned to work as a clerk at the Scottsville Post Office. He married Pauline Parr on 22 July 1925. In his early years as a postal clerk at this post office on Scottsville's Main Street, Mayo could carry all of the out-going mail in one bag to the train depot. At that time, each of the three rural routes covered about 126 miles. By the 1950's, each of the three rural routes covered 168 miles, and the local mail box patrons grew from 25 to more than 200. Mayo was appointed Scottsville's Acting Postmaster on 15 November 1939 and its Postmaster on 12 July 1940. Mayo served as Postmaster of Scottsville Post Office until his retirement on 30 June 1958; he was succeeded as Postmaster by Edward G. Gildersleeve. 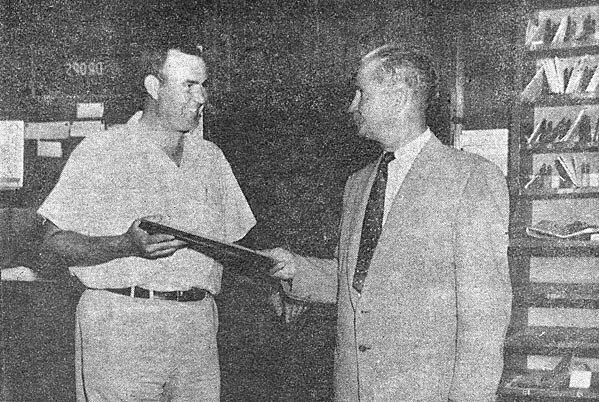 Below photo shows Mayo at right handing the cashbook at Scottsville Post Office to Gildersleeve on 30 June 1958. Mayo passed away on October 10, 1967, in Scottsville. His wife Pauline, born November 16, 1902, passed away in Scottsville on December 3, 1978; she is buried next to her husband, Ashby, at Scottsville Cemetery. Edward Gildersleeve was a native of Pocohantas, VA, and moved to Charlottesville where he graduated from Lane High School in 1938. He attended the University of Virginia and served with the U.S. Army Air Corps during World War II. He and his wife, the former Odelle Lewter of Holland, moved to Springfield Farm near Scottsville in 1951. Gildersleeve was sworn in as acting Scottsvon postmaster on 30 June 1958 and as its Postmaster on 21 September 1959. Gildersleeve retired from the position of Scottsville Postmaster in February 1979. 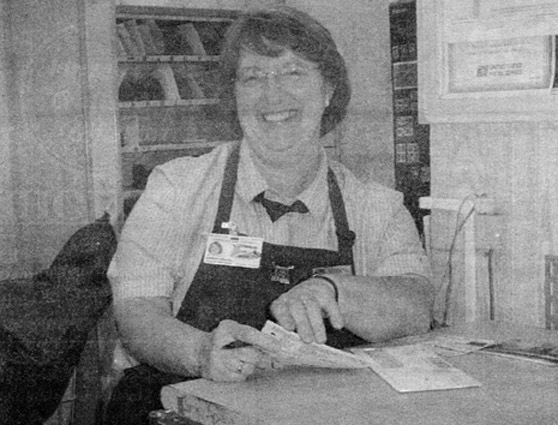 In the 2005 photo above, Barbara Brochu had been greeting customers to Scottsville Post Office and helping them with their postal needs for 19 years. Barbara started her postal career in Charlottesville as a 'casual employee', without benefits before taking the Postal Service exam and coming to work in the Scottsville P.O. Barbara believes in "treating people the way I would want to be treated", an attitude which has earned her the community's affection and respect. On 11 May 2011, Barbara was appointed Officer-In-Charge of Scottsville Post Office, and she served in that role until 09 July 2012. Barbara continued working at Scottsville P.O., and she and her husband, Joe Brochu, reside at Holly Hill in Esmont, Virginia. Post Office at 358 Valley Street (right behind the horse and tree), 1884-1914. This building was built in 1840 and served as an inn during canal days in Scottsville until the U.S. Postal System rented it in 1884 to serve as the town post office. Scottsville Post Office, 110 Scottsville Rd., Scottsville Shopping Center. This building has served as the town's post office since January 10, 2008. 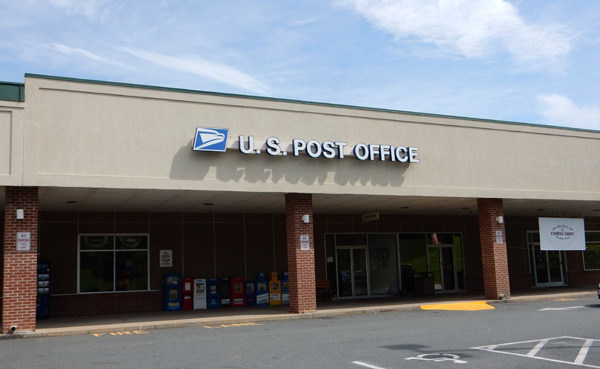 This post office was originally established as Scotts Ferry Post Office on April 29, 1814. 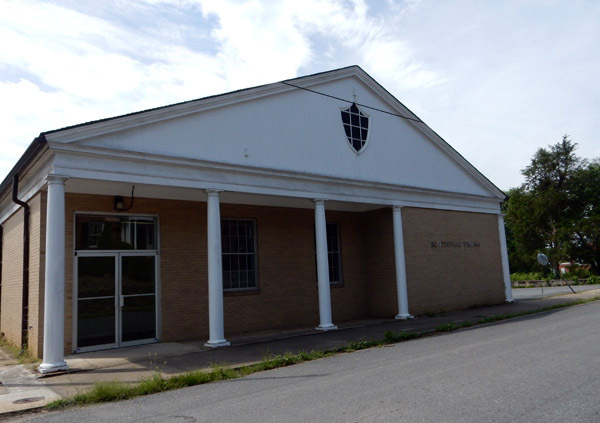 Its name was changed to Scottsville Post Office on October 4, 1850.
his appointment date is unavailable.